SeekingBostonMarathon is an amateur's journey to race in the ultimate annual marathon--the Boston Athletic Association's Boston Marathon. This is not an olympic runner or professional runner's advice site, but an "average joe" who got hooked on running and finally reached hallowed ground in 2010 and is constantly seeking to get back to Boston. 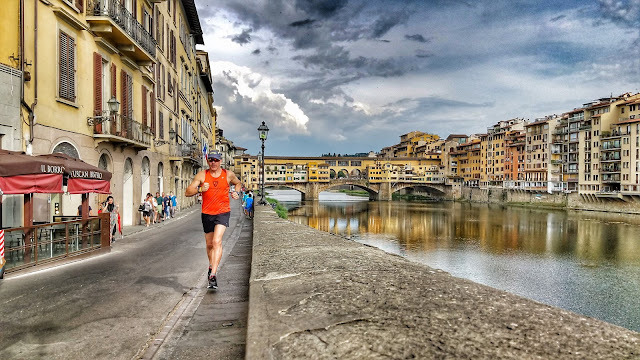 If you've ever wanted to go to Italy or fantasize about running in exotic lands, this blog post is for you. The answer to that this month was Italy! I've been fortunate to have toured many great countries included parts of Europe, Asia, and Africa, but never made it to Italy. This trip was the "brainchild" of my wife's (thank you honey) that instead of filling the base of the Christmas tree with pointless gifts, we'd "scale back" the holiday spending and give the kids (more like young adults) a trip of a lifetime instead. Spending a good majority of my life on a plane, I'd accrued enough miles on United and points with Marriott to send the family of five (cinque) to Florence and Tuscany. 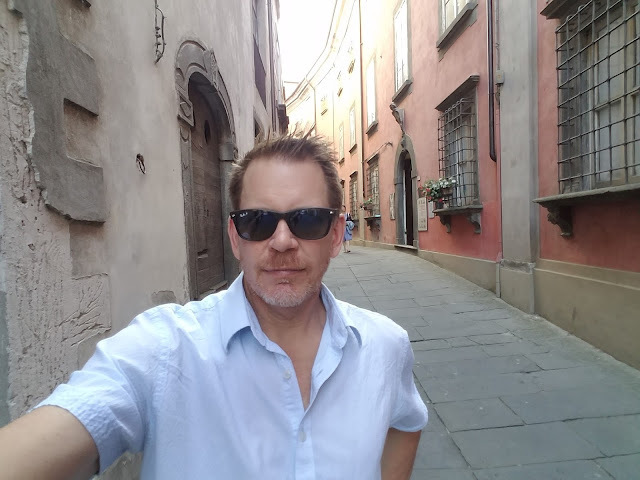 I'm the "king" of over-thinking and second-guessing sometimes trivial things and I was candidly concerned about the major section of our trip in Tuscany. 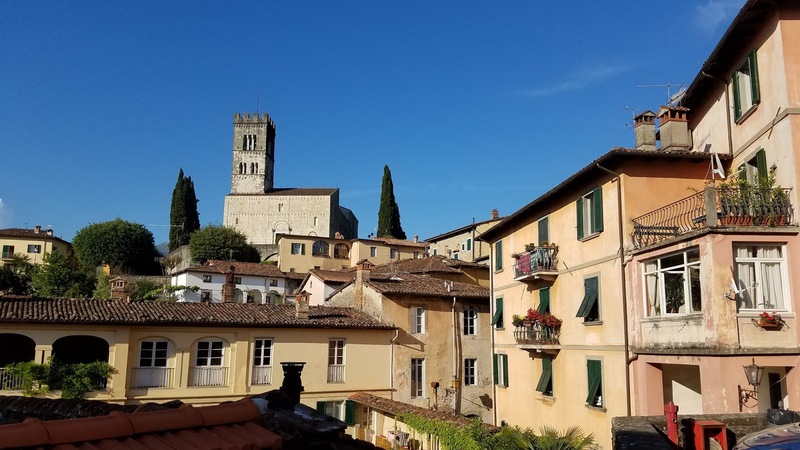 The Renaissance Tuscany Il Ciocco in Barga looked amazing as a romantic getaway or wedding destination (they had a big one there while we stayed there,) but would it keep my kids entertained (I pondered?) The emphatic answer was YES, and exceeded expectations. With that, a few of the highlights of our trip including the 40 miles logged on my Fitbit over our stay. or for me, much larger which warrants even greater respect for the piece. As a freshman art major in college (many years ago before switching to business) I'd learned how the head was intentionally out of proportion and much larger than the body. The logic being, you'd view from below and it would look proportional from your vantage point. 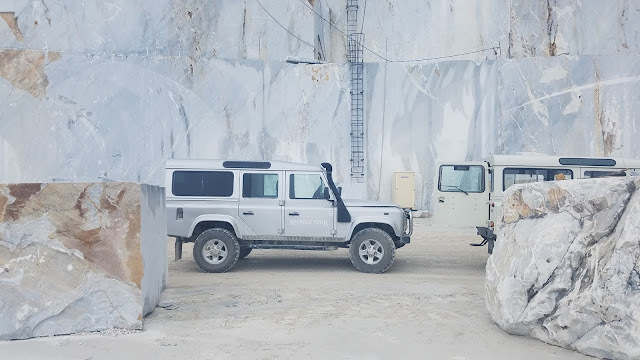 Like many other images you've seen your entire life, it looks as imagined, but you get to walk around and see the side, back, and different vantage points you didn't see in class or on the internet. Part II of the trip was heading to our hotel in the Tuscany region of Italy in a small town called Barga. Many parts of Barga resemble what you've seen in pictures that are less-traveled and less tourist'y than the larger cities of Florence and Rome (on the subject of Rome, we chatted with some families who'd just arrived from Rome and said that the crowds were overwhelming. While I'd like to see Rome, apparently, height of summer is the wrong time to go.) Barga was a quiet and romantic town with the old part of town (like many other Tuscany region towns) with the stucco homes and restaurants on top of the hill with the signature church bell tower.) Walking the streets of Barga almost seemed "fake" like we were walking along a cobblestone movie set. Absolutely stunning. We did find some fun in Barga as there was a pub at the mouth of the town wall and a sliver of median that served up a bar and Beatles "cover band" one night. The kids and parents had a blast indulging and dad and son danced with a couple older women tourists. We joked at the pool later how one was "smitten" with my son probably thinking he was an Italian boy. Lots of laughs on this trip. Another item high on my list was the infamous Cinque Terre cliffs along the rugged coast of the Italain Riviera. 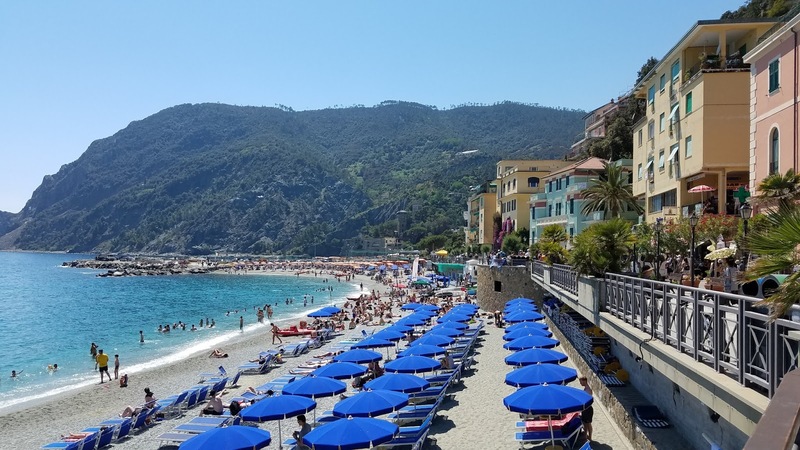 Cinque is Italian for "five" as there are five villages (lands) that comprise the iconic area that overlooks the Tyrrhenian Sea. Like a hillbilly tourist, I'd "hacked" the word Cinque (pronounced "chink-ay") calling it "sink tear" and "serk tear" (neither correct) and incorrectly labeled the sea we swam in as the Mediterranean (grade school geography was a looong time ago.) The water was the perfect temperature and crystal clear. It felt liberating to swim with my kids in the water and again had some great laughs (see video below influenced by the movie Jaws.) As I mentioned above, I logged a ton of miles on my Fitbit (but haven't figured out how to log swim and bike miles yet) and got in some great run shots in this amazing area. I'm glad I made the train as the Extra Virgin Cooking Class with Giuseppe Mazzocchi was "AMAZING." It was an Italian holiday (Republic Day or Festa della Repubblica) so the class normally started by buying produce in the markets, but we were able to still buy our bread and a few other items for the cooking itself. 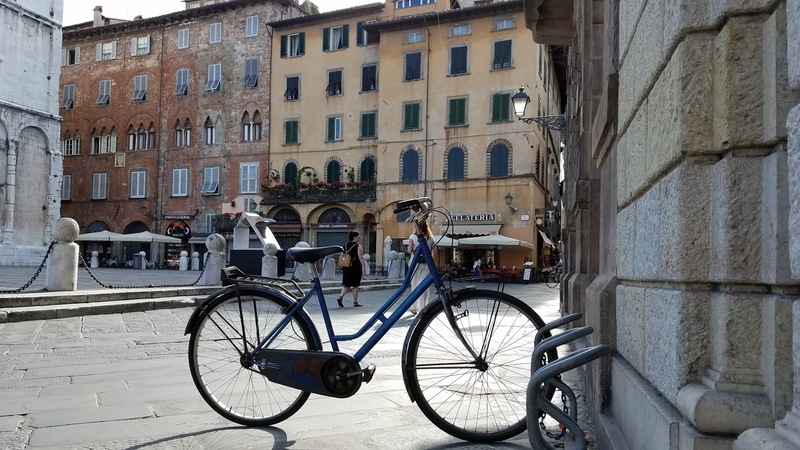 Giuseppe lead us through Lucca sharing some of the history and color of the town (some describe it as the way Florence used to look including a wall that surrounds the city. In the morning it boasts several runners and cyclists who circle the top of the wall bordering the city.) Arriving early, we were able to walk Lucca (quite a bit larger than Barga, but smaller than Florence) and enjoy one of many expressos and churches that characterize the city. My kids want to come back as there's an amazing concert venue in the center of town that will host the Rolling Stones later this year. As far as the class, we were pleasantly surprised to land at Giuseppe's palazzo as the location for the class which was gorgeous. 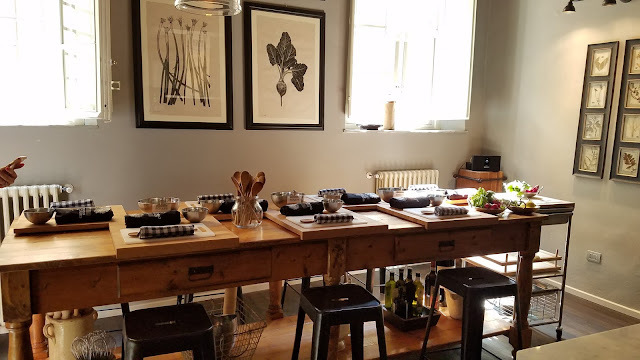 He liberally poured local prosecco, white wine, and red wine (wine is crazy cheap in Italy) as we prepared zuccini croquets, salad, asparagus risotto, and saltimbocca which is a combination of veal and prosciutto with basil. The food did not disappoint and we loved the area of Lucca. Between Lucca and Florence there's some amazing shopping. My boys both got Italian loafers and haircuts their last afternoon before going "clubbing" their last night with their sister. Given more time, I probably would have had a suit made as the prices and quality are impressive. I did spring for a $30 shirt that looks like it would cost me $130 at Nordstroms back home and picked up a number of other gifts for friends back home. They're also known for their leather products and many deals (and bartered) can be found in Florence and Lucca. Our third excursion was to the marble quarries in Carrera which is where some of the world's finest marble comes from. With my wife being in the kitchen and bath industry, this was another highlight of the trip and the kids enjoyed this more than I'd expected. At a break in the tour, they served us lardo which sounds absolutely disgusting as it's pretty much pure lard, but treated with salt. It was served to the slaves (derived from the nearby Slavic region) as a very basic meal, but became a delicacy over centuries. It's a love it or hate it food staple. With wine and some prosciutto, I found it quite tasty. 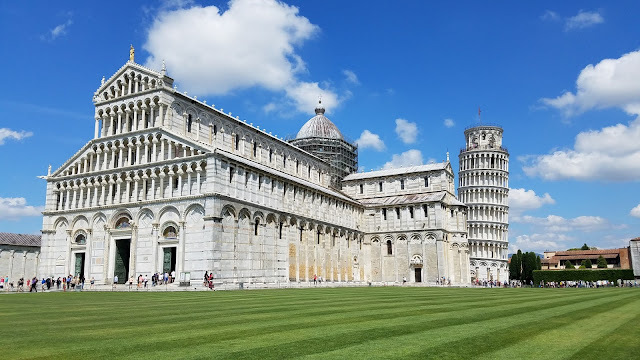 After Carrera, we stopped in Pisa to see the infamous "Leaning Tower of Pisa." 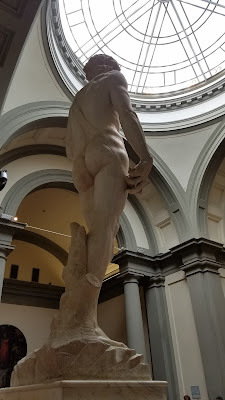 The tower was impressive and like "David" was much larger than I'd expected. The surrounding city was a bit "meh." We finished the trip back in Florence. We filled the day with a few pints in the pub around the corner from the AirBNB Florence Apartment we rented for our last night in the city. We once again packed in a LOT including some shopping, drinking, date night with my wife while the kids went out clubbing. Rumor had it that my recent college graduate daughter (seen in the video) enjoyed dancing with a young italian man who spoke very little english. No wonder my daughter wants to go back, as we all do. Ciao for now until we find out where in the world Seeking Boston Marathon goes next.